What a wonderful, wonderful book. I loved everything about it, the story, the history, the characters, the writing. If you love books, reading and history then you will love this book. My only negative comment is that it was to short. But luckily I discovered there is a second book ‘ The Sultan’s Eyes’ which continues the story. I am going to start reading this book straight away before I get pulled too far away from Isabella and her world. 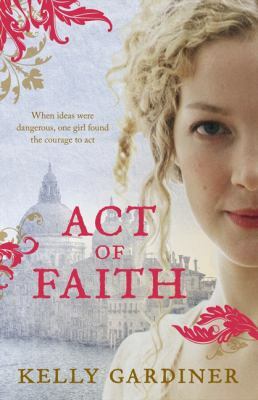 Do yourself a favour and read ‘Act of faith’, YOU WON’T BE DISSAPPOINTED. This entry was posted in Australian Authors, Historical Fiction, Young Adult and tagged Act of faith, Australian Author, Historical Fiction, Kelly Gardiner by admin. Bookmark the permalink.